I’ve been compiling this list of dress-making fabric suppliers for myself for a while in Notebook and thought it might be helpful to share it in case it’s useful to anyone else. It’s certainly not exhaustive and I haven’t bought from all of these sites but they are here because I’ve seen interesting/lust-worthy/just what I need on them at some point and have returned to them more than once. Most of them also sell haberdashery and patterns from independent designers (I have a list of those too here). Merchant and Mills Fabric and fabulous haberdashery (the Baby Bow scissors and enameled entomology pins are two of my big favourites). The Cloth House If you tell them what you’re looking for they will send samples from the very large selection they have in their amazing London shop. They also have a small selection available on their website. The Eternal Maker- I really like the way this site organises the fabric. It’s really easy to search. 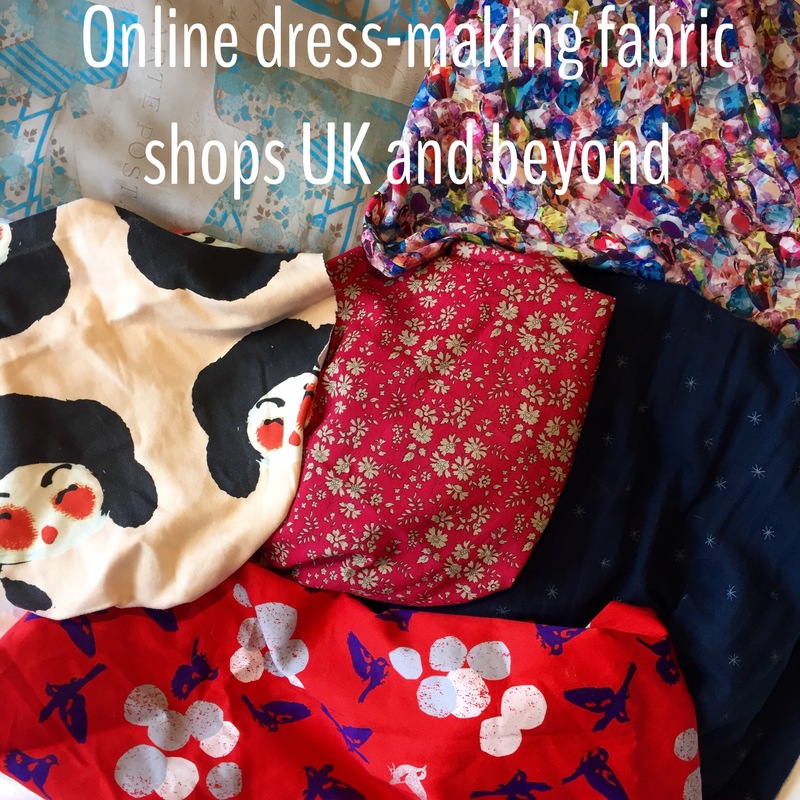 Guthrie and Ghani- a very lovely selection of fabric, haberdashery and patterns with a fab blog of owner Lauren’s makes for inspiration. Ditto Fabrics – big selection, fast delivery. I got some great stretch denim here. Tissu Fabrics– I like the way the fabrics are displayed on black dressforms on this site so that you get an idea of opacity and drape. MacCulloch and Wallis I find this website a bit glitchy to use but worth a look if it works. Some amazing and unusual fabrics, trims, haberdashery and hardware. Plush Addict– Good selection of dress-making fabric as well as quilting and home decor too. The Draper’s Daughter– Beautifully curated selection of fabrics, including Nani Iro and Atelier Brunette. Fabworks Mill Shop Lovely dress making and furnishing fabrics, including a range of Avoca beauties. Offset Warehouse Offset Warehouse is a social enterprise which brings together a huge range of hand-picked eco fabrics and haberdashery. Doughty’s Big selection of dress making, quilting and craft fabrics too. Centre for Advanced Textiles– Based in Glasgow, custom design printing onto a range of fabrics (similar to Spoonflower listed below). The sites up above also sell knits but these two specialise in them. Here’s a link to the Kitschy Coo list of fabric suppliers which includes quilting too. Discovery Knitting British woven range of beautiful knits of all weights and types. Some only available as wholesale or in minimum number of metres. Beautiful plain knits in a huge range of different materials. I’ve bought silk for dying from both these shops- the quality is really good! See Merchant and Mills up above too. Euro Japan Links– Specialists in materials for Sashiko embroidery. They sell the fabric, thread, needles, thimbles as well as some samplers. Beautiful stuff! Cousette, France- Gorgeous selection, particularly the knits. Really quick delivery to the UK too. Spoonflower, USA- print anything you want on a big range of fabrics or upload your own design. They have a factory in Berlin (as of April 2016) so no more customs charges when you order.